Over the past few years we’ve had neighbors move out of the homes on either side of us. There was no one to take care of the lawn and the weeds started to take over and began to spread into our yard. Ugh! This year we are determined to rid our poor lawn of the weeds and have a green, healthy yard for Baby Digger to run barefoot on! Fertlizing can be messy and trying to pour the bags into the spreader usually ends up with fertilizer on the ground too, especially if I do it 🙂 I was super happy to review the newest innovation in lawn fertilization, the Scotts Snap Spreader Lawn Care System! How neat is this?! The Scotts Snap Spreader System takes all the mess and guesswork out of fertilizing your lawn. It uses special Scotts Snap fertilizer bags that you just snap on the spreader, lock it and start fertilizing. It was very easy to setup and literally mess free, there was no spillage at all and we don’t have to struggle with pouring the large and heavy bags. No more fertilizer everywhere, just on the lawn where it belongs. Another great feature is that it automatically spreads the correct amount of fertilizer, so you don’t put too much or too little on. The bags cover our yard, I don’t know the exact square footage but it is a standard subdivision lot and we have a little less than half a bag left after one application. So each bag provides us with 2 treatments. It also has a edge guard switch so you don’t end up wasting and getting fertilizer on the sidewalks or driveway. When your done, you just flip the switch and unlock the bag from the spreader and store it. I love this because you don’t have to try and get the leftover fertilizer back in the bag. Plus, it is so compact and doesn’t take up a lot of our precious garage space. We don’t have a shed so our garage has to store all of outdoor gear so I’m very happy that it doesn’t take up a lot of room. Even though it is narrow and compact it still has a great spread reach for each pass and it only takes us 15 minutes to cover our entire yard front and back. The Scotts Snap Spreader System bags do cost a bit more than a traditional fertlizer bag but the cost is worth it to me because there is less wasted fertlizer. That combined with the convience factor makes it totally worth it. The Scotts Snap Spreader itself is very affordable, I saw it for only $29.98 at The Home Depot which is about the same cost if not less than a traditional spreader. I’m very happy with the results of our Scotts Snap Lawn Care System, our lawn is looking much better already and it’s very easy to use and mess free. Scotts Snap Lawn Care System is available at the Home Depot and Ace Hardware, find a retailer near you. The spreader is about $29.98 and fertilizer starts at $18.98. 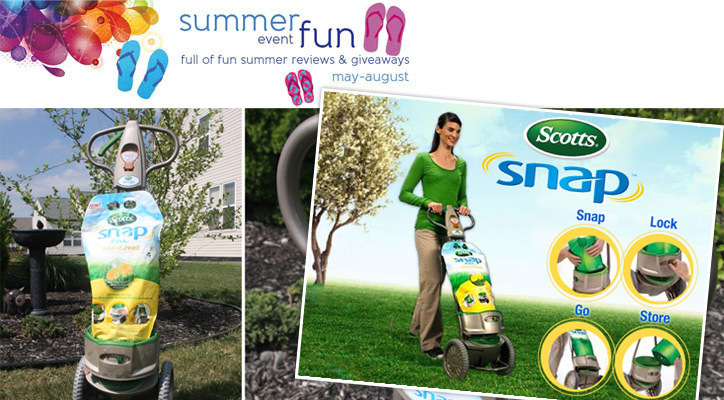 Scotts is giving one lucky winner a Scotts Snap Lawn Care System! To enter fill out the Rafflecopter form below. Ends 6/19 at 11:59PM EST. I learned that your yard should be treated regularly for grubs! PRETTY COOL that you can get a customized plan for your lawn JUST by entering my zip code! I like the section on indoor and Container gardening.